Now locally pronounced Dauphin (Daw’ fn) Island, Ile Dauphine is in the Gulf of Mexico near the Alabama coast. In 1699 the French-Canadian explorer Pierre Le Moyne d’Iberville named the island for the many human skeletons he found on its beaches. In 1708 Jean-Baptiste Le Moyne de Bienville changed the name in an effort to console the dauphine who, in France, was mourning the death of her mother. His gold compass eye finds bones banked in sand. He spits, returns to the skiff. Ile du Massacre. renames the island. Un geste politique. The dauphine continues to grieve for her mother. to be named after dolphins, a haven from sharks. where the salt heat was hard to look through. Grandpa’s a small man. He waves his cigar. for each of the heavyweight champs that we name. One of his biceps can dance like an egg. to give me his chore dragging in crab traps. I’ve seen dolphins passing these breakers. Other days crest into afternoon. Three minds awash and nothing to say. Grandpa’s the lord in scenes James rehearses. I think about wrecks, beasts, and beasts’ play. near dolphins rolling down the shoreline. but the word bottle-nose made him smile again. The island’s other names remained buried. crabs’ claws, the weather band, stars. with cracked faces in sepia light. in the names of slaves and dead kin. then come to sleep at their mother’s breast. I clasp her bones as the Gulf crashes. Creatures, leaving voices, circle our beds. When I wrote “Dolphin Island” in the 1970s, ecology was a relatively new term in popular consciousness, and there was less recognition then than there is now that seemingly other issues are also environmental. This poem primarily looks backward—to the history of Dauphin Island and to different phases in my own small history there—through a backdrop of age-old local warfare, maritime disaster, and predators social and from the deep. The presences “Dolphin Island” tries to speak against are the ongoing losses and oblivion in the dark around us. In later visits to the island I’ve observed the increasing new presences of oil rigs on the horizon. From the beach, the lights on the rigs appear beautiful in the night, reminding me of the beauties of certain poisonous flowers, that collective thoughtlessness and short-sighted entrepeneurial opportunism toward our planet remain privileged, and that as we continue to foul our waters and more, “The darkness drops again” within our lifetimes and Yeats’ “Second Coming” is at least as timely now as when he wrote it in 1919. I regret there’s less ambiguity as to that timeliness than there is in the implications of the circling creatures at the close of my wishful poem. “Dolphin Island” was rejected by more than thirty magazines before the Prairie Schooner published it about ten years after it was written. 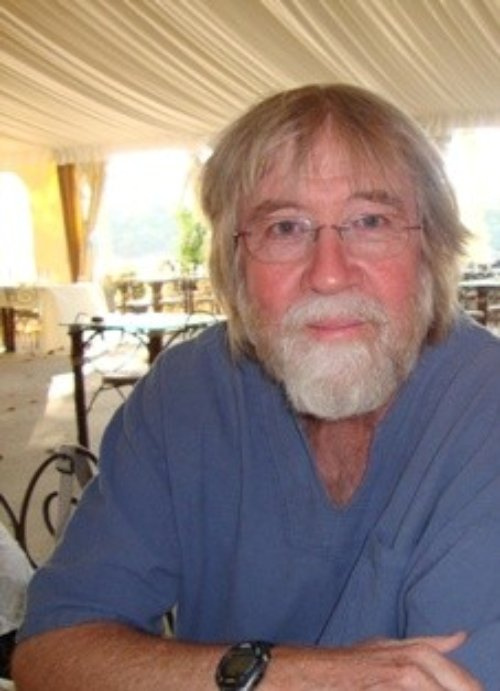 Randy Bates’ other publications and credits include a book of nonfiction, Rings: On the Life and Family of a Southern Fighter; work in Grand Street, Ploughshares, and the Southern Review; and a writing fellowship from the National Endowment for the Arts. He teaches at the University of New Orleans.